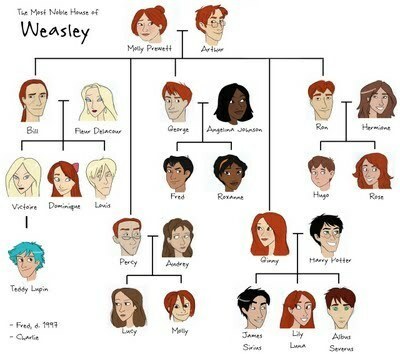 Weasley Family Tree. . Wallpaper and background images in the Harry Potter club tagged: harry potter cast weasley family. No, Teddy Lupin is Victoire's "friend"
Ron and Hermione's children ... are cool ... HUGE FAMILY TREE !!!! hahaha !!!! @wotcher-tonks: at least George named one of his kids Fred, eh? How do you know so much about people who weren't in the epilogue? does teddy lupin have blue hair or is that how the picture was just put that way? OMG! That's a HUGE family! Oh my god, Massive family!! XD I want a family like that!! @kpcrowe77 Teddy is a metamorphagus (Sp? Also, that means, like his mother, he can change his appearance at will) and is seen most often with blue hair. wait how do you know this?? what book..? teddy is lupin and tonk's son. mss_218: Yes but in the epilouge James said he saw Victoire and Teddy "snogging"
Why is one of Harry's kids' named Albus Severus,when Harry never liked Snape? omg the green eyes on albus severus are really creepy but still this is awesome! omg is beautiful!! i love weasley family!!!!!!!! Sad tat fred is dead!!! The kids may love fun uncle george, but they dont know the half of it. Albus's eyes are kind of creepy..but otherwise awesome! And @ShAShRox27 um what? I can hardly understand that! @ros59 did you read or watch the last Harry Potter?.. Percy's there! He married Audrey and had Lucy and Molly! @Hermione-Fan361: It doesn't mean to show that Victoire is Teddy's mother, it's suppose to show they are dating, the artist probably ran out of room or thought it showed dating as the lines are connected as the mother/father - siblings lines are. This is a great tree! Need Fred to finish it off. *sobs* RIP Fred!! wait... What happend to teddy in the movie? Is it just my delusional mind, or does Louis look a bit like Draco Malfoy? i wish i was part of that family!!!!!! teddy is tonks son, tonks is a metemorphogi (if u dont know what that is, refer HP and Order of Phoenix). So Teddy can change his appearance in will, just like tonks :) She had pink as her standard, he probably has blue as his standard. Why is Bill ugly in this? I mean, it does say he got a scar, but JK said that he still had good looks. I find it a little sad that Fred asked Angelina to the Yule Ball, but after Fred died, Angelina married George. Still, at least they named one of their kids Fred. That was sweet. Yeah but why is Teddy there? Teddy is Lupin and Tonk's son??? but still like the idea! Great family tree! Love Fred and Roxanne. Although it's actually James Sirius who has red hair and Albus Severus who has black. LOL Charlie's just. . . There.